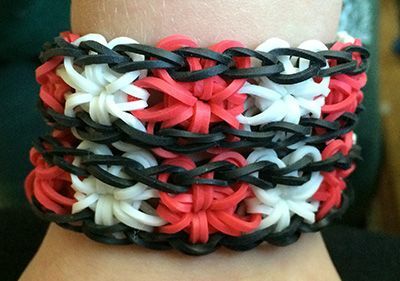 The starburst bracelet is probably the first complicated looking bracelet that most people try when learning to use a Rainbow Loom so I decided to give it a go and make Charlie a couple of them. He’s only five years old, so anything more complicated than a triple single is usually up to me. Keep them in order. It will make hooking the bands so much easier. Use a contrasting colour for the capping bands on the starbursts at least the first time you make the pattern. It will help you keep track of where the capping band lies as you work. Despite it’s complicated look, I found this design is very easy to work and memorise and it’s already become a favourite of Charlie’s and mine. I hope you’re enjoying my series of Rainbow Loom posts and that it’s saving you a lot of time having to go through youtube videos to find the best ones! Don’t forget to sign up to be notified of future blog posts if you’re interested in more. Next time I’ll be posting a photo tutorial of my own as well as some videos on adding large charms, Loomey Time watches and button closures.